We work very closely with TheThriftShopper.Com and ThriftShopORama.Com to help bring more content to your website. This helps to keep the customers coming back! We offer a special page for your website so that you can incorporate your auction listings from ThriftShopoRama.Com directly to your website quickly and easily. ThriftShopORama.Com is a venue where charity-driven resale stores can sell their donated art, antiques, collectibles, clothing, and fine furnishings in an online auction format. We work exclusively with charity resale stores and we don't take a percentage of the sale price, so 100% of the profits from completed auctions go directly to the charities themselves. Our shoppers have the benefit of knowing that the dollars they spend on our site support the needs of the charities and organizations offering items for sale. ThriftShopORama.Com was designed specifically with thrift stores in mind and provides the lowest-cost alternative to hosting an online marketplace. ThriftShopORama.Com was created and is owned and operated by Brigitte Martinez and Michael Gold. Between them, Michael and Brigitte have more than 45 years of thrift shopping experience. ThriftShopORama.Com combines their enthusiasm for everything that thrift stores and the Internet have to offer. Michael also owns and operates TheThriftShopper.Com, a free national directory of charity thrift shops all over the United States. ThriftShopORama.Com is a sister site to TheThriftShopper.Com, which links to ThriftShopORama.Com on all of its 20,000 pages. 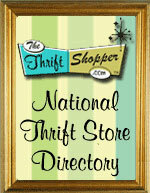 TheThriftShopper.Com gets over 200,000 hits a day and has become the go-to website for serious thrift shoppers for the past five years on the Internet. Michael has been involved in the thrift store industry for over five years and has spoken at national thrift store conventions on the topics of marketing, Internet exposure, and thrift store management. Brigitte is the author of Thrift Store Goldmines. She turned her passion for vintage items into a part-time business by selling her finds to vintage shops in Hollywood, California, in the pre-eBay days. Brigitte is now an 11-year professional eBay seller who exclusively uses thrift stores as her inventory source.